Confirmed as a Dual Format edition for July 23rd. 'The German invasion of England took place in July 1940 after the British retreat from Dunkirk. Strongly resisted at first, the German army took many months to restore order. But the resistance movement, lacking outside support, was finally crushed. Then, in 1944, the resistance movement reappeared'. That is the story of what happened when history was re-written. The Nazis have won the Second World War and is an army of occupation in England's green and pleasant land. Aged just 18 when, along with Andrew Mollo, Kevin Brownlow embarked on this ambitious documentary-style drama, the film took eight gruelling years to complete. The result is both a frightening and - with fears of fascism reappearing throughout Europe - a timely reminder of what might have happened if the Allies had not defeated the Nazi menace. I've been wanting to see this for years, since Winstanley blew me away. My favorite of the recent batch of announcements. I first saw this at the NFT (now BFI Southbank) around 1994 - as it happened, the first public showing of the complete version, with Brownlow introducing it and answering questions afterwards. A definite buy for me. While it's a little rough around the edges, it honestly doesn't come off as the work of two teenagers with only pocket change. This is an amazing, underrated film that absolutely should get a new following, especially with the way things are today. Easily one of my most anticipated releases of the year. I highly recommend reading Brownlow's book on the film, How It Happened Here, as it's one of the best books about filmmaking I've read. I have a vague memory of bunking off school with a mate and going up west to Soho for a sleazy afternoon. We ended up in a cinema just off Piccadilly Circus normally reserved for the dirty mac brigade and seeing 'It happened here'. I have absolutely no idea why it was programmed there unless Brownlow himself was a regular habitué. Far from disappointed that we hadn't scored Debbie does Dallas I like to think it set me on the path of less salacious fare and onto one of cinephilia instead of scopophilia. FlickeringWindow wrote: While it's a little rough around the edges, it honestly doesn't come off as the work of two teenagers with only pocket change. In some ways the roughness of the filming lends a certain documentary verite look to certain scenes, almost Peter Watkins-like in some moments. I kind of wish someone would have put together an extra here on Peter Suschitzky. I would have loved to have seen a history/analysis of his work on this film and how it lead to or informed his later work with Peter Watkins and David Cronenberg. 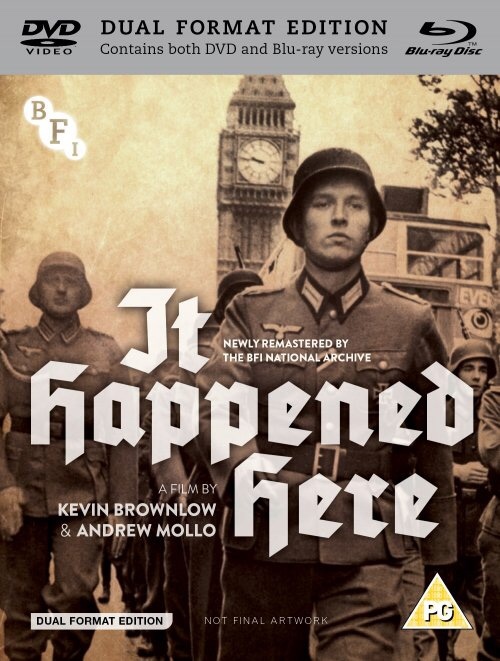 Kevin Brownlow and Andrew Mollo’s immensely powerful It Happened Here depicts an alternative history in which England has been invaded and occupied by Nazi Germany. Coming to Blu-ray for the first time, on 23 July 2018, the film is presented in a new 2K remaster (from the original camera negative) by the BFI National Archive, supervised by Kevin Brownlow, to mark his 80th birthday. A raft of exceptional extras include previously unseen behind-the-scenes footage, new interviews, news items, trailers and more. That is what happened when history was rewritten: Nazi Germany has won the Second World War and England is under occupation. Kevin Brownlow was only 18 when he and Andrew Mollo – just 16 – embarked on this ambitious neorealist-tinged drama, which took eight years to complete, helped along by financial support from Tony Richardson (Woodfall Films). Shot on both 16mm and 35mm, with a mainly amateur cast and with incredible attention to detail, the impressively polished result is a chilling and timely reminder of what might have been had Nazism not been defeated.